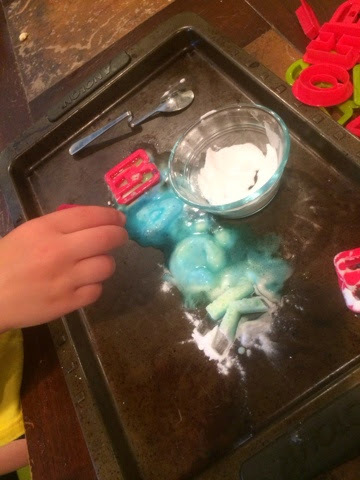 One of my favorite ways to occupy some time when I need to get dinner cooked is to set out a tray of baking soda, colored vinegar and some eye droppers. 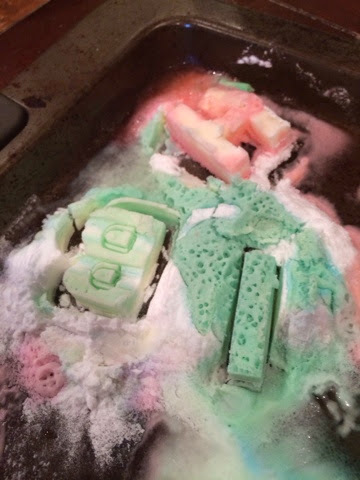 It never gets old and can keep my 3 year old entertained for at least 30 min! Because it’s an experiment that we do often, I like to try to think of ways to freshen it up a bit, so we came up with erupting letters! We have been working on letter identification and spelling names, so I tried to incorporate this into our science play! 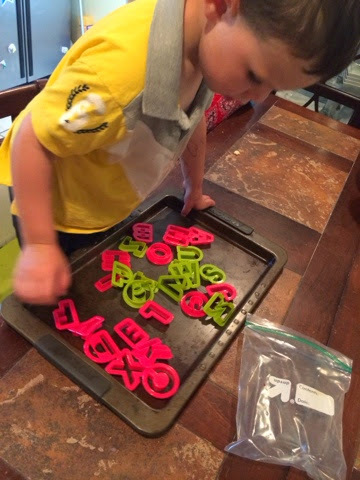 These letter cookie cutters that I got from Hobby Lobby are awesome (and you can usually get a 40% off coupon which makes the set around $3), we have used them for so many projects, except for making cookies ironically! I started by laying them all out and had Mack find the letters that he needed to spell his name. Once we had that set we started coloring our vinegar. 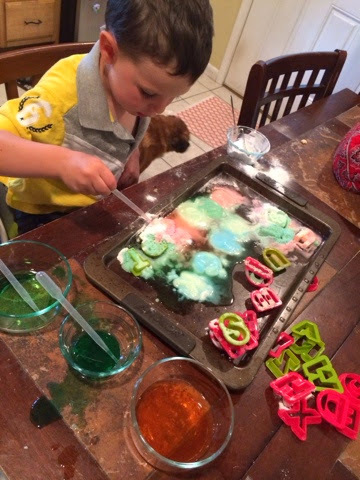 I love to give Mack a handful of food coloring and 3 bowls and let him practice his color mixing, he almost always mixes green first 🙂 We also love using eye droppers and syringes while being ‘scientists’, plus it’s fantastic fine motor practice! I found these on Amazon. 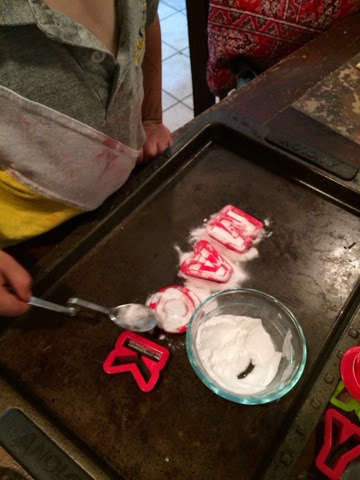 We then filled our letters with baking soda. 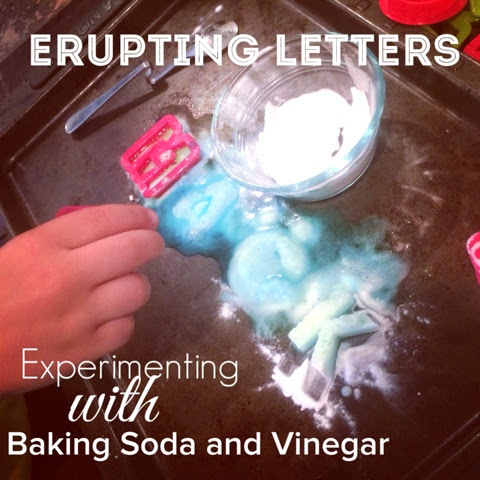 Then we added the vinegar to make our letters erupt! There is something about this process that kids just love. 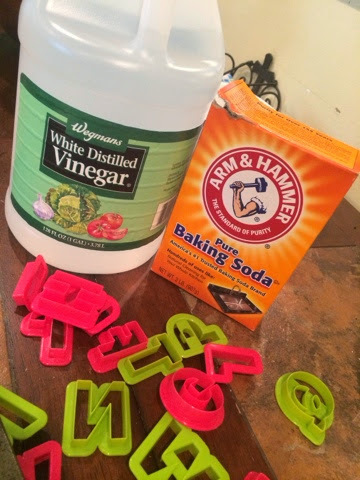 Once the baking soda was wet enough we could actually remove the cookie cutter and the shape of the letter would remain. This seemed magical to Mack 🙂 I love watching him explore and learn. He went on to explore with other letters. 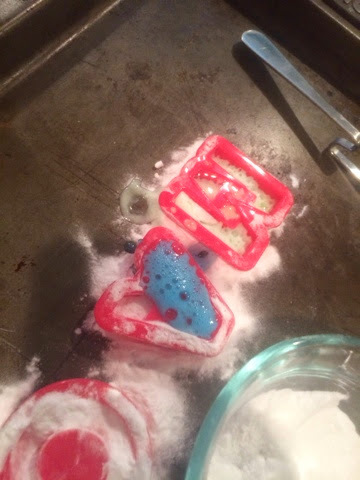 We learned that if we made a pile of baking soda, placed our cookie cutters in the pile and then made sure the vinegar didn’t escape the mold, we could get some really great letter prints! 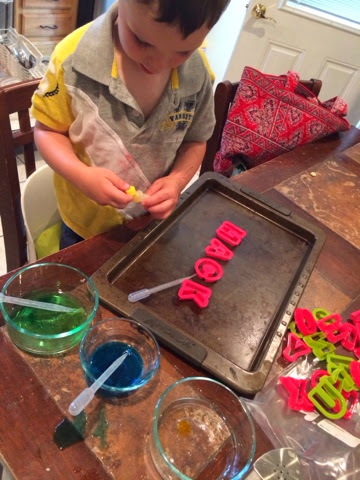 He went on to make the entire alphabet and was occupied for a good 45 min, I actually had to pry him away from it to go to his swim lesson, and he resumed his experimenting after dinner. I love when we create something that he is really drawn to.